UW going with a three-guard lineup out of the break. Trice for Happ. Happ sits coming out of the TV timeout. Trice in. 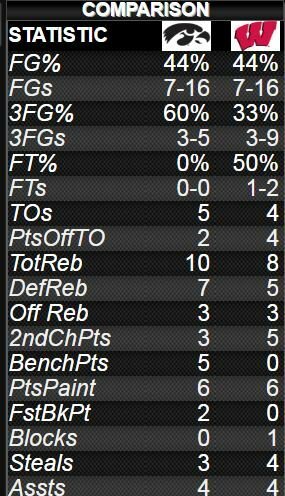 UW mixing and matching three-guard lineups early on. UW leads 10-6. Offensive flow looking much better in three-guard set. Bronson Koenig has splashed a pair of deep triples and Wisconsin leads 15-11 at 11:52 in the first half. #Badgers up 15-11 at the 11:52 mark. Koenig with two 3s. All five starters have scored. Bronson Koenig with back-to-back triples for the #Badgers , who are 6-for-11 from the floor and 3-for-7 3FG. #Badgers Koenig getting open looks and is 2-3 from 3. UW had a 15-11 lead, and ball, with 11:52 left. #Badgers had Trice on Jok while Showalter got a breather and Iowa didn't take advantage. Neat to have the Thundercloud Singers here pregame to pay tribute to @BronsonK_24 with a ceremonial song. Iowa sky blasting. Hawkeyes 3-5 from three. Badgers are 4-10. #Badgers up 21-17 at the 7:58 mark. Koenig with 9 points, all on 3s. Jordan Bohannon with a pair of 3s for Iowa. Koenig 3-4 from 3 for 9 points to lead #Badgers , with a 21-17 lead with 7:58 left. UW with 5 turnovers. Bronson Koenig is now 3-for-4 from downtown and he's got a game-high 9pts for the #Badgers . UW shooting 47.1% FG. Now Iowa is banking in 3s at the shot clock buzzer. Hawkeyes 4-for-6 from the 3-points line and trail 23-20. #Badgers have 8 turnovers and Iowa is 5-7 from three (71.4%). Iowa lead is 26-23 with 3:48 left. UW rushing on O.
Iowa on a 9-0 run and leads 26-23 with 3:48 left until halftime. UW with 8 turnovers in 25 possessions. Iowa follows up bad back-to-back three point tries from Koenig & Prtizl w/ a made three. Hawkeyes up three. Man, those last few #Badgers possessions were ugly. Ethan Happ with 7 points, 3 rebounds, 2 assists & 1 block for the #Badgers . Wisconsin and Iowa each with 8 TOs. Badgers 4-12 from three, Iowa 5-7. UW on a run of five consecutive empty possessions, with three turnovers in that span. Badgers have run only two bigs at a time since first TV timeout. Happ-Hayes-Brown in regular rotation. Aaron Moesch coming in to save the day after six consecutive ugly possessions for Wisconsin. #Badgers Gard took Brown out and brought in Moesch with 2:29 left. Badgers deserving exactly what they are getting in the first half. Iowa leads 29-23 with 1:49 left. Timeout Gard. Iowa's run at 12-0, UW's empty possession count at 8. Hawkeyes up 29-23 with 1:49 left. #Badgers Happ misses a lay-in and Iowa gets a three from Baer for a 29-23 lead. Can't keep missing from 2 feet. Iowa hits another 3 and Wisconsin calls timeout. Hawkeyes are 6-for-9 from downtown.